Whenever we reach the realization that something isn’t going as planned and the outcome isn’t what we had hoped, we get that sinking feeling. I got that sinking feeling last just last night. 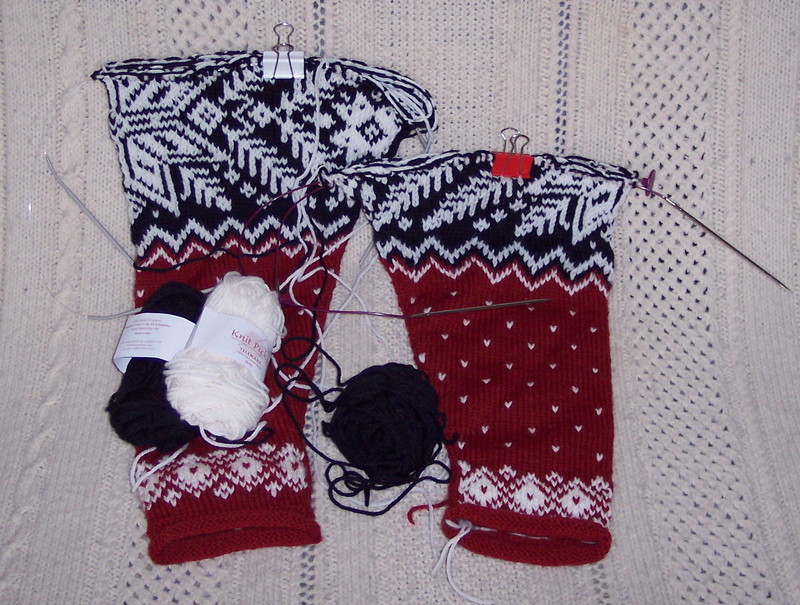 I was working on my long-neglected Dale of Norway Gjende, and it suddenly dawned on me that, although I had enough white yarn to finish the sleeve I was working on, the one on the left in the photo, there’s no way I had enough to finish the rest of sleeve #2, let along the neckband. So the search began. Did I have another ball or partial ball of Knit Picks Telemark in Drift stashed somewhere? I have 2.5 extra balls of the dark red, and 1 extra of the dark navy, but there is no extra white to be found. I search through the box with the rest of the extra Telemark. No white. I search through my knitting bag. No white. I search through the crate that holds most of my current UFOs (UnFinished Objects to you knitting know-nothings). No white. There is no white Telemark to be found anywhere in this house. What choice do I have? There’s no other way but to order another ball from Knit Picks. Oh, I can hear you non-knitters now. Well, you say, that’s a pretty sensible way to resolve the situation. You need another ball of yarn, so buy it already and shut up. Ha, says I. What do you know about it? It may seem simple–just buy another ball. But you knitters know what I’m talking about, don’t you, I say with a knowing wink. One ball of Telemark cost $1.99, but shipping is $2.99, so I cannot simply order one ball. That’s crazy. I’d be paying more for the shipping than for the yarn. Who in their right mind would do that? So, in order to save $2.99 shipping on a ball of yarn that costs $1.99, I ended up spending $52 and change. How’s that for economy? Oh, these Internet businesses. They sure know how to entice us into buying more than we intend to buy. Just offer us FREE shipping on orders of $X or more. I don’t always fall for it. Really. Not always. I recently ordered a computer book from Amazon(dot)com that qualified for SuperSaver shipping if only I spent just a little more. But I did a few calculations and the shipping was really much less than I had to spend to get the FREE shipping. And the shipping for the book didn’t cost MORE than the book itself. But $2.99 to ship a $1.99 ball of yarn? Not on your life. Besides, I was going to by the Wool of the Andes for the boy’s Aran sweater sometime, right? No time like the present, right? No stash too large, right?